Respondent :- State Of U.P. Thru Prin.Secy.Deptt.Of Basic Edu.Lko. & Ors. Heard learned counsel for the petitioner and Shri Ajay Kumar, learned counsel, who has accepted notices on behalf of Basic Education Board/respondent no.2. The government has issued a GIO on 22.12.2016, a copy whereof is Annexure - 5 to the Writ Petition, disclosing the pathetic state of affairs of non-availability of teachers more particularly in rural areas and non-utilisation of the services of those who are posted in the urban areas. Having considered the submissions raised, the Basic Education Board is under an obligation to carry out these arrangements in a way effectively so as to reach out to the basic problem of education that is suffering on account of the ratio of the teachers that are required in the institutions both in the rural areas and in the urban areas. Learned counsel for the respondents submits that this arrangement can now be made only after the elections because the involvement of the staffs in the elections is compulsory. 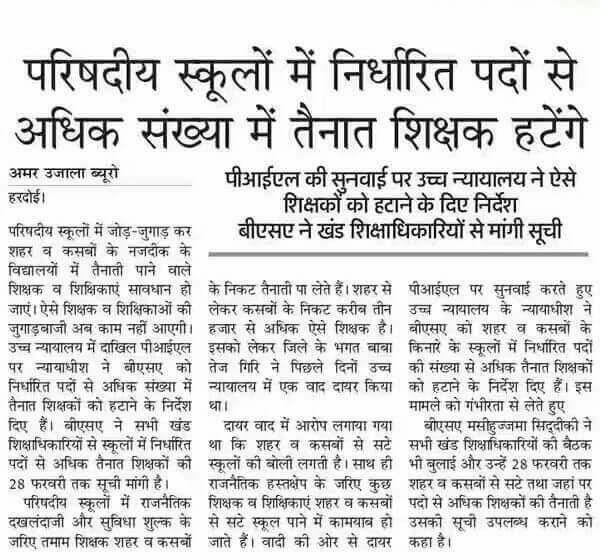 Having considered the submissions raised, let this matter come up after 11th of March, 2017 but during this period, the Basic Education Board shall carry out an exercise visioning the future postings that may be required in the District - Hardoi keeping in view the problems that have been indicated in the writ petition by filing an affidavit in this Court.